First of all, don't ask how much you should pay for a one-carat ruby. A one carat ruby can be worth ten dollars or it can be worth $10,000. Quality makes the difference. Fortunately you can see differences in quality if you look at a lot of rubies side-by-side. Better color costs more, a lot more. Better clarity costs more. Better cut may cost a little more but it is worth it! The bigger the stone, the more it is per carat. Within each variety, prices are based on these four Cs, with color as the most important factor. There is a more detailed explanation in the judging quality section. But different varieties have different price ranges. This is where the prejudice comes in. Some varieties are lower in price because they are readily available, some because the color isn't very popular (brown and yellow stones, for example), some because the material is relatively soft, and some because ...they have all the right stuff but no one knows it. There are plenty of examples of beautiful rare gemstones that cost less than gems that are less rare because they have a funny name, or people get them confused with an inexpensive variety or no one has ever heard of them. But enough about the injustice of the gem market. We can break the price ranges of the different gem varieties down into five basic categories: traditional gemstones, new classics, connoisseur gems, collector gemstones, and affordable gems. These categories have basic price ranges, but, again lower quality stones or stones with less popular colors may cost less and stones with particularly fine quality or color may cost more. These price ranges are meant to give you a general idea of the relationship of prices between different kinds of gemstones and not to serve as a price list, since color and quality can make such a difference. The traditional gemstones are ruby, emerald and blue sapphire. Because of their lasting appeal and distinguished history, ruby, emerald and sapphire are more valuable than other colored gemstones. 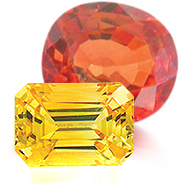 Generally, ruby and emerald are also priced higher than a comparable quality sapphire due to rarity. For a one-carat stone of average to good quality in the varieties in this category, you can expect to pay between $250 and $10,000 per carat. Of course truly fine gems will cost more. The new classics are gemstones that are the rising stars of gemstone jewelry: tanzanite, tourmaline, aquamarine, imperial topaz, and tsavorite garnet. These gemstones are sometimes available in standardized sizes but you really should look at some fine larger single stones to see why they have so many fans. Gems in this category range between $50 to $1,000 per carat for an average to good quality one carat stone, with a good example of tsavorite easily reaching $3,000 per carat. Connoisseur gems are gemstones that have a more specialized market because they are more rare. These gemstones include black opal, jadeite, pink topaz, chrysoberyl cat's-eye, fancy colored sapphires, and rare stones like demantoid garnet and alexandrite. These gemstones are highly prized and prices range from $250 to $5,000 per carat, although alexandrite with a good color change will command at least $10,000 even in a one-carat size. Collector's gems are not available in quantity to be marketed effectively so you get a lot of beauty for the money. This category includes spinel, zircon, moonstone, morganite and other beryls, and many rare gemstones. Red and hot pink spinels can command a few thousand per carat but most of the gems in this category will sell for hundreds not thousands. Then there are the affordable gemstones, which combine great color with a surprisingly reasonable price and good availability. These gems include some old favorites and some new gems: amethyst, white opal, citrine, ametrine, peridot, rhodolite garnet, blue topaz, iolite, chrome diopside, kunzite, andalusite, and many ornamental gemstones such as lapis lazuli, turquoise, onyx, chrysoprase, nephrite jade, and amber. Prices for these gemstone range between $5 and $100 per carat for a one carat stone. In every variety, especially the more expensive ones, you should expect to pay more for matched pairs, sets, and special shapes and cuts.